Between masterminding Downton Abbey and writing for upcoming adventure epic Pompeii, Julian Fellowes has somehow found the time to adapt Shakespeare’s Romeo and Juliet for another big-screen outing. The result, directed by Carlo Carlei, is impressively realised considering the director has previously worked predominantly in his native language and on TV movies. Carlei’s Italian roots are suggested in the well-chosen architecture and landscapes which provide locations representing Verona; sun-dappled vistas and wide-angle shots of castles provide a scale difficult to achieve in stage productions, which goes some way to justifying this rather straight adaptation. Fellowes’ screenplay, like many before it, retains the language of the Bard. However, here it is not juxtaposed with a disjunctive modern setting (such as in Baz Luhrmann’s 1996 version), but performed by actors weighed down by layers of period dress. Unfortunately the script occasionally lapses into rather contemporary phrasing, causing unsought moments of disjunction. 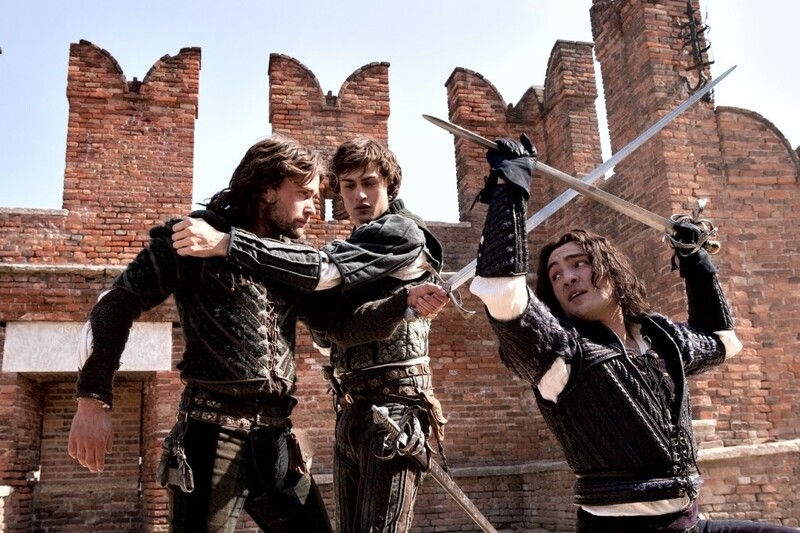 Carlei’s film revises only minor aspects of Shakespeare’s plot, for instance trimming insignificant characters and by beginning with an organised contest between Mercutio and Tybalt rather than staging the play’s customary opening brawl. This has little effect on the narrative, but maximises the inclusion of elaborate period detail. A bold move made by this adaptation is the casting of noticeably youthful actors Douglas Booth and Hailee Steinfeld in the titular roles. 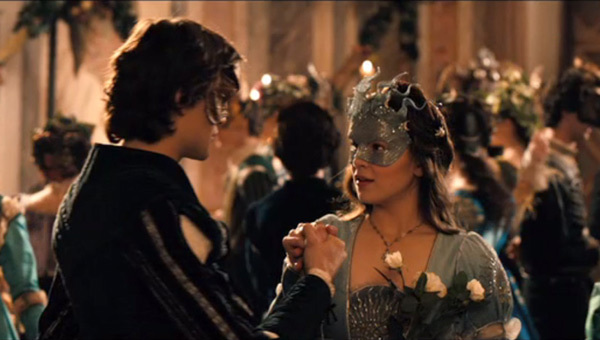 Emphasis on the characters’ beauty almost reaches the point of fetishising the actors; early on Juliet is shot in slo-mo and soft lighting, to a score of sentimental tinkling music which irritatingly accompanies many of Romeo and Juliet’s meetings. Yes, it’s romantic. Romeo’s first appearance seems to be inspired by Zac Efron’s Rolling Stone cover; we first meet him chiselling a statue, with his shirt hanging off to reveal a chest shining with sweat. Thankfully the entire film isn’t devoted to trying to establish breakout teenage heartthrobs, and ultimately the angrier characters are much more engaging throughout. 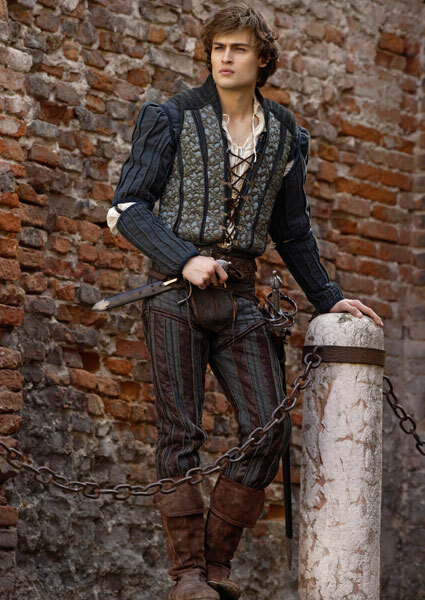 Damian Lewis is charmingly wicked as Capulet, and Ed Westwick’s Tybalt crafts an intensely convincing ruthless villainy which almost makes you root for him over Christian Cook’s less-than-charismatic portrayal of Mercutio (Harold Perrineau’s version of the character, in Luhrmann’s Romeo + Juliet, is difficult to top). But the casting of Carlei’s Romeo and Juliet does largely yield excellent performances. Paul Giamatti stands out as Friar Lawrence, nailing his friar’s wry wit, religious authority and especially his grief on discovering the dead lovers. This adaptation includes a lot of familiar faces, some surprising, such as Stellan Skarsgard as Prince of Verona. 17 year-old Kodi Smit-McPhee’s career is likely to get a boost thanks to his memorable and mature performance as Benvolio. Despite the overly sentimental treatment of the love story, Carlei’s film doesn’t scruple in presenting violence. The clashing of swords must be the most frequently used sound effect, and even the silvery title script is suggestive of sword blades. Scenes of Romeo and Juliet frolicking after their wedding are intercut with footage of Tybalt practising his swordmanship, forewarning of the mayhem and bloodshed to come and creating a tone of inevitability. The successive deaths of Mercutio and Tybalt are vibrant and well choreographed, and their significance as needless collateral damage to the pursuit of Romeo and Juliet’s forbidden love is successfully conveyed. Fellowes and Carlei have produced a lucid and comprehensive adaptation ideal as a way into the play, which despite a pretty lacklustre trailer is an enjoyable watch. For creativity and originality, however, it cannot supersede Luhrmann’s film. This entry was posted in Film Reviews and tagged Baz Luhrmann, Carlo Carlei, Damian Lewis, Douglas Booth, Downton Abbey, Ed Westwick, Hailee Steinfeld, Harold Perrinau, Julian Fellowes, Kodi Smit-McPhee, Paul Giamatti, Pompeii, Rolling Stone, Romeo + Juliet, Romeo and Juliet, Stellan Skarsgard, William Shakespeare, Zac Efron. Bookmark the permalink.